NAPCAN was impressed with the calibre of nominations for the Play Your Part Awards and proud to award the 17 recipients for playing their part to promote the safety and wellbeing of children and young people, through inspiring initiatives including the South East Integrated Family Support Services in Tasmania, a voluntary program that works with vulnerable children, young people and families across the state. The Malabam Health Board Aboriginal Corporation, received a Northern Territory award for the “GREATS” Youth Service initiative which promotes strong peer and family relationships; self-esteem, resilience and social connections in the Aboriginal Community, which ‘is staffed by our community mob’, said Noeletta McKenzie, manager of GYS. In the past three years Maningrida community has not been affected by any youth suicides, a significant achievement in a complex environment. The National Individual Play Your Part Award went to Amrit Versha for being an inspiring advocate for children’s safety and wellbeing in the migrant and refugee community. Amrit Versha knew no one when she arrived in Australia 27 years ago. She has since committed herself to ensuring migrant women, children and families don’t feel alone but are supported, empowered and connected to their community. Two other National Play Your Part Awards went to Kids Helpline and Optus for the Kids Helpline @ School program and the National Children’s and Youth Law Centre and collaborators for Lawmail, Lawstuff and Online Safety. The South Coast Child Wellbeing Network and the Immigrant Women’s Health Service received their New South Wales Play Your Part Awards at a ceremony at Juniper Hall, Sydney which featured the As Eye See It exhibition. The photographs and stories displayed expressed the view of the world by children and young people in out-of-home care as part of National Child Protection Week community events. The South Coast Child Wellbeing Network was formed under the ethos that Protecting Children is Everyone’s Business. The network joined together to promote the wellbeing and safety of children and young people as a community responsibility in an area with a significant number of vulnerable families. The Immigrant Women’s Health Service were recognised for the Multicultural Parenting Project. The CEO of the Immigrant Women’s Health Service, said that the Project “educates children by teaching parents which in fact educates the nation”. Congratulations to the Play Your Part Award recipients. Read about the Inspiring Prevention Initiatives from each State and Territory that were recognised by NAPCAN in 2015. 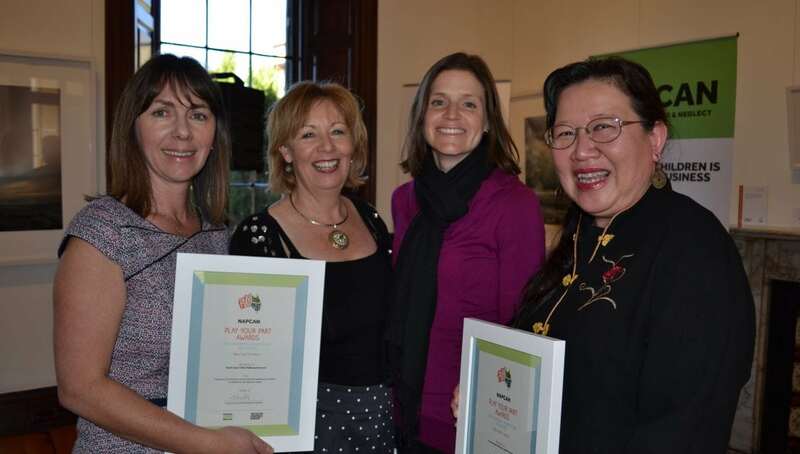 Pictured are the NSW Play Your Part Award recipients, from left Johanne Sneddon and Samantha Lukey from the South Coast Child Wellbeing Network, Anna Richardson an original member of the Network’s working party and Audrey Lai, the Management Committee Chair of the Board of the Immigrant Women’s Health Service.